Other use from the traditional world : the Flip, which is running the fingers through the sheets to see a few drawings before and after through the light table. 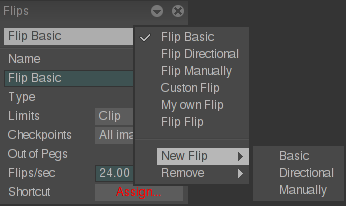 And as there exists as many ways to flip as there are animators, TVPaint Animation 11 now has a custom Flip panel. Thanks to it, you will be able to configure your preferences. 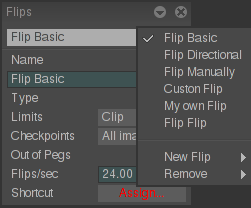 By clicking and dragging on Select a Flip, you will be able to create three Flip types. 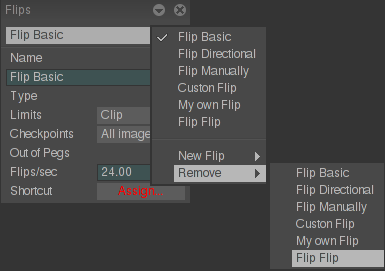 The pop-up menu on top of the panel will let you select Flips, to Create new ones and to Delete them.